DARLINGTON, SC (WMBF) - The News & Press and the Darlington Kiwanis Club will have their 3rd Annual Christmas Contest. The contest will allow kids to illustrate their favorite Christmas carol or song on a sheet of 8-1/2" x 11" paper. Write the child's name, age, parents and phone number on the back and mail it to The News and Press. "This began as a fun way to involve children with the newspaper because kids love to see themselves and their artwork in print," says Lisa Chalian-Rock, Darlington Kiwanis Club board member and former editor of The News & Press. 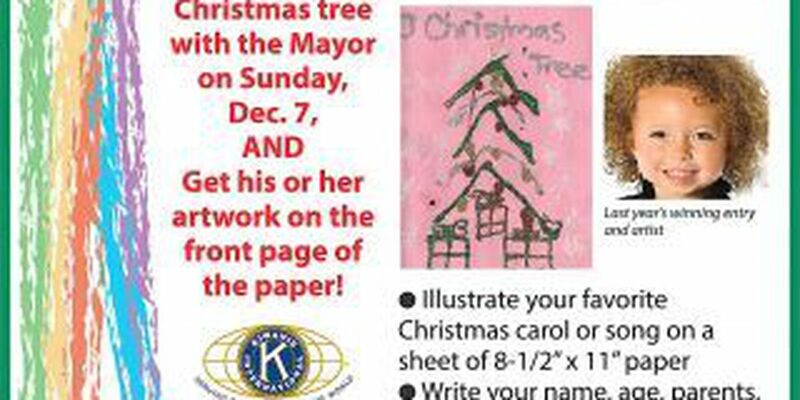 During the Kiwanis Carolighting service, the winner will light Darlington's Christmas tree along with the Mayor on Sunday, December 7. The winning illustration will also be placed on the front page of the newspaper. Last year, Dani-Jo Asaro, used glitter and colored paper to illustrate "O Christmas Tree". The Kiwanis Carolighting begins at 5:30 p.m. on the Public Square, after the Christmas Parade. In addition to Christmas carols and the lighting of the tree, there will be other music and prayer. Submissions should be mailed or delivered to 117 South Main Street, Darlington, SC 29532, by Friday, November 21. Include a SASE for returns or drop by the office to retrieve the illustration after December 7. There is no charge to enter the contest.